Sayuki (see his paintings) was born in the year of 1963 in Ndanda in southern Tanazania, in the region called Mtwara. His father originated from Makua tribe and his mother comes from Mwera tribe. Sayuki finished Primary School in Ndanda, afterwards he continues with Seminar in Lindi. He attends only the first year of Secondary school. He starts his painting in 1981 when reaching 18 years. That was in Ndanda and he paints himself. Three years later he comes to Dar Es Salaam where works mostly as a sign writer. 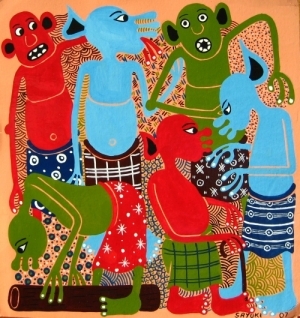 Four years later, in 1998 his art takes him back to his birth place Ndanda where he starts the Tingatinga style painting. Sayuki is known for his mashetani style which comes from 1989 and is similar to the style of late George Lilanga. Finally he moved to Dar es Salaam again and now he is living in Mbagala suburb . He has one son named Stamili who is also painting. He is around 20 years. Sayuki is very good friend with Max Kamundi. They are neighbors visiting each other on daily basis.